The Immunization Calculation Engine (ICE) is a state-of-the-art open-source software system that provides clinical decision support for immunizations (CDSi), commonly referred to as “immunization forecasting.” ICE has two major components: The ICE Web Service evaluates a patient’s immunization history and generates the appropriate immunization recommendations for the patient. The Clinical Decision Support Administration Tool (CAT) is a web-based GUI tool that enables subject matter experts to manage ICE rules and configuration without the intervention of software developers. The ICE Web Service evaluates a patient’s immunization history and generates the appropriate immunization recommendations for the patient. The Clinical Decision Support Administration Tool (CAT) is a web-based GUI tool that enables subject matter experts to manage ICE rules and configuration without the intervention of software developers. Any organization may freely adopt ICE due to its open source license and complete lack of dependence on any commercial software. The ICE software system has been publicly released as an open-source software system, under the GNU Lesser General Public License v3 (LGPL v3). Through its standards-based Web Service interface, ICE easily integrates with third party clinical information systems such as electronic health record systems (EHR-S), Immunization Information Systems (IIS), and Health Information Exchanges (HIEs) – regardless of their software architecture (.NET, Java, or other). Because of ICE’s Java-based implementation, it can be deployed in diverse technical environments. The open-source ICE Web Service is immediately available for production use and may be downloaded from the publicly accessible ICE wiki. For more information about ICE, including a cloud-based deployment of ICE that any organization may freely connect to for evaluation and testing, please send email to ice@hln.com. To help you evaluate the ICE Web Service, HLN Consulting has created a simple “ICE Client” application, integrated it with the ICE Web Service, and made it freely available so that anyone can easily submit sample patient data to the ICE Web Service and then see the results that it returns. The browser-based ICE Client connects to an instance of the ICE Web Service that is hosted by HLN and is configured with ICE’s Default Immunization Schedule. To integrate the ICE Web Service with your own client application (such as an Electronic Health Record System, Patient Portal, Health Information Exchange, or an Immunization Information System), follow the installation and integration instructions on the ICE wiki. If your organization would like any assistance with ICE, HLN offers a variety of optional customized services that can be tailored to meet the specific needs of your organization. ICE comes pre-configured with the childhood, adolescent, and adult schedules for fourteen vaccine groups. The ICE rules are thoroughly documented on the ICE Wiki and are based on the recommendations of the Advisory Committee on Immunization Practices (ACIP). However, any organization may configure ICE to suit its own needs and can adapt ICE as new vaccines come to market and as the recommendations of the ACIP change. Test Editor – For testing the ICE Web Service without the assistance of a software developer. This tool enables subject matter experts to create, store, and manage test cases. At the click of a button, users can execute hundreds of fully automated tests in seconds. The tool displays success and failure statistics after each test run. For each failed test, the tool reveals precisely how the actual evaluations and recommendations differed from the expected results. ICE is maintained through an open and collaborative process. 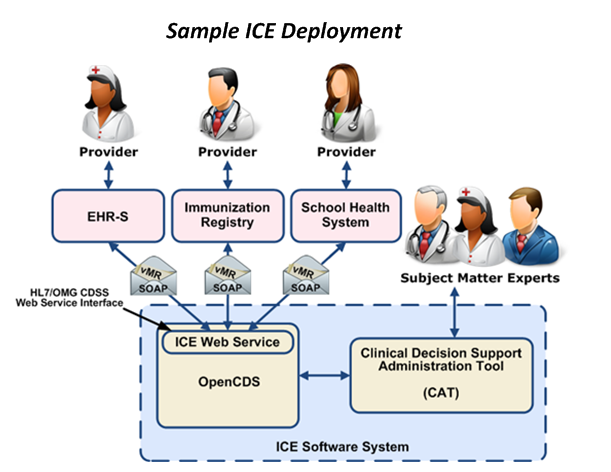 The ICE Web Service has been implemented as a clinical module within OpenCDS, an open-source software framework that provides developers with a set of tools for implementing clinical decision support services. Clinical information systems may utilize ICE by making a SOAP Web Service call to the ICE Web Service, which conforms to the Decision Support Service (DSS) standard that has been specified by HL7 International and the Object Management Group (OMG). The clinical information system sends a patient’s data to ICE utilizing the Virtual Medical Record (vMR) format, which is an emerging standard within the HL7 Clinical Decision Support Workgroup. In response, ICE utilizes its immunization rules and the data in the vMR, such as the patient’s date of birth, gender, immunization history, and disease indicators, to evaluate and return the validity of each immunization in the patient’s history along with one or more evaluation reasons. ICE also returns a recommendation for each vaccine group along with a recommendation reason. ICE’s Web Service architecture scales to support simultaneous real-time processing of many patients submitted by one or more systems. It can also service requests for multiple immunization schedules. For example, a single ICE deployment could enforce one immunization schedule utilized by multiple EHR-S, another immunization schedule used by an IIS, and a third immunization schedule utilized by a school health system. The ICE software system is being developed and configured by a collaborative partnership of public health and information technology experts from the New York City Department of Health and Mental Hygiene, Citywide Immunization Registry (CIR); HLN Consulting, LLC; the Alabama Department of Public Health (ADPH); and the OpenCDS collaboration which is led by researchers at the University of Utah, Department of Biomedical Informatics. Members of the ICE collaboration participated in the CDSi project that was funded by the Centers for Disease Control and Prevention (CDC). For more information about ICE, contact ice@hln.com.